Top Spanish politicians, including Prime Minister Mariano Rajoy, have attended a funeral service for a regional leader shot dead on Monday. Isabel Carrasco, head of the provincial government in Leon and a member of the governing People's Party (PP), was shot as she crossed a footbridge. A mother and daughter are being questioned over the killing. Reports say the daughter was fired from a council job in 2011 and had just lost a dispute over payment. 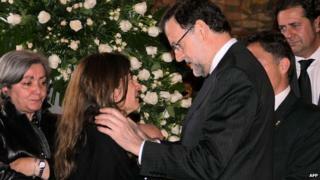 Mr Rajoy called the killing "a cruel, pointless, absurd deed" and said that he had known Ms Carrasco for many years. "She was competent, hard-working, intelligent and tenacious and dedicated her life to politics," he said. A televised debate between the Popular Party and the Socialists has been postponed until Thursday. The funeral service for Ms Carrasco was held on Tuesday evening at Leon Cathedral. Hundreds of local people who had gathered outside to pay their respects applauded as the cortege left the cathedral for a city cemetery where a private cremation was held. Police are continuing to hold two suspects, a mother and daughter, in custody in Leon. The pair have reportedly refused to give a witness statement to police. Spanish media say the arrested women are the wife and daughter of a local police chief. Local reports say the daughter lost her job over three years ago but recently lost a legal case against the council relating to overpayment. A Popular Party official confirmed that both women were members of the party. Police are searching the Bernesga river for the firearm used in the killing. Ms Carrasco 59, was the leader of the Popular Party in Leon, and had been head of the provincial government since 2007.